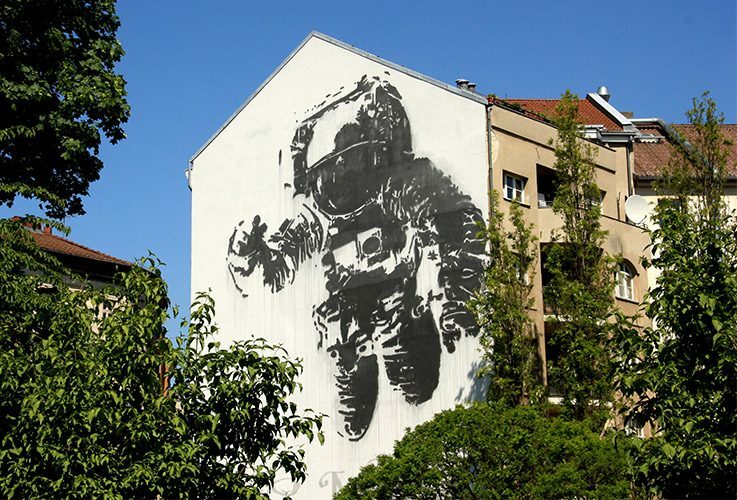 French artists’ Victor Ash’s Astronaut Cosmonaut has achieved a cult mural status for Berlin. It is one of the most pictured murals in Berlin – a legend! Standing in Berlin-Kreuzberg near Kottbusser Tor and painted during the legendary Backjumps Festival #3 in 2007, the painting of a floating astronaut on 22 x 14 meters strikes a particular chord in Berlin. Victor wanted to concentrate and express his past experiences and visions of Berlin - the space race between the USSR and the USA but also the different Berlin subcultures and the desire to escape reality. “I got inspired by David Bowies “Space Oddity” from 1969 in which he tells the story of a astronaut who gets lost in space and later on with the song “Ashes to Ashes” in 1981 where Bowie tells us that the spaceman was in fact a junkie on a trip”. For the artist, the Astronaut/Cosmonaut represents the will to escape to other universes, “as a little child, I escaped to a fantasy world with my space drawings and as a teenager, I escaped to subcultures to find my identity in the urban environment where I grew up”. For the Parisian artist born in 1968 and fascinated by the Cold War, space exploration, graffiti, subcultures & electronic music, Berlin was to become from the mid to late 80s to the present a focal point of his attention, with regular trips to the city alongside artistic projects and residencies. To mark the 10-year anniversary of the iconic mural painting in Berlin Kreuzberg, the Urban Spree Galerie invited Victor Ash for a special pop up exhibition. The exhibition centered around the cult figure of the Astronaut with numerous original/stenciled works on paper and a mural at Urban Spree. A series of screen prints is expected to be released as well.